September | 2014 | JUDDER! Hope you are all well and enjoying our little burst of Indian summer! It sure helped us to have a great old Judder last week with our JUDDER UNDER CONSTRUCTION – a splendid night by all accounts, with some fab costumes and safety gear in full effect, a couple of banging sets from guest DJ [rebelbrethren] and much revelry until the wee small hours! It was good to see lots of first-timers having a blast, so let’s hope we can keep growing the Judder family – don’t forget to spread the word! Phots from the night are up in the Judder webpage gallery and on Facebook so get tagging your friends! Next Judder is our WILD WEST COWBOY JUDDER! 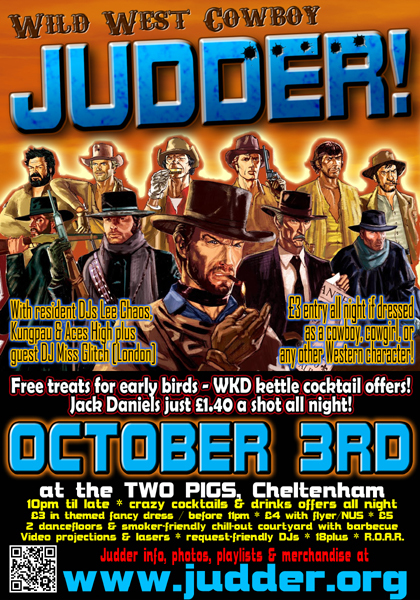 on Friday 3rd October – It’s time to grab your chaps, polish up your six-shooter and get on your horse & join us for the wildest party in the (South) West! We will be joined by guest DJ Miss Glitch from London, and as a special cowboy treat, we’re extending the Jack Daniels’ offer for another Judder – JD is just £1.40 a shot all night, and Honey Jack is only £1.80, plus will have lots of giveaways to continue celebrating Jack Daniels’ birthday! Entry is just £3 if in fancy dress and there will be giveaways for early birds so come down early and hoe-down at the best party in town! The other important thing we need to tell you is that this year, our JUDDER HALLOWEEN SPECTACULAR has been brought forward a week – this year we will be opening the doors of our fully decorated haunted house on Halloween itself – FRIDAY 31ST OCTOBER. We will also be giving you another 2 HOURS of haunted house clubbing and running from 9pm – 4am, PLUS we have guest DJ Geoff Lee from dancefloor-fillers MODULATE, so it’s shaping up to be a somewhat legendary evening! And if you can’t wait that long to hang out with the Judder crew, a whole bunch of us will be performing and having a lovely time at the Bleephaus stage as part of FrogFest which takes place at the Frog & Fiddle in Cheltenham on Saturday 20th September – if you like your music electronic and experimental, then this is the place to be! More info here. See you all at the ranch!